The world we live in today is much different from the one our grandparents lived in. Unfortunately, today there’s much more violence and mayhem. Places that once were typically thought of as safe environments now can be rife with violence. When you go to work every day, probably one of the furthest things from your mind is whether or not you will be physically safe in your building. However, providing security and a safe environment should be one of the top priorities of your management. Sure, the bottom line is always top of mind for managers, but protecting those who help the company make its bottom line is imperative. Recently employees have become all too frequent victims of assaults and other violent crimes that have occurred in the workplace due to lack of security. Some of these assaults have even resulted in fatalities, but an even more have resulted in serious injuries, which have led to loss of wages, medical bills and other expenses incurred by the victim. Of course every employer should be concerned about the safety and security of its employees as well as its customers. Not only does it make sound business sense to reduce the potential for workplace violence by having adequate security, but it also makes sense to avoid exposure to litigation. The Bureau of Justice Statistics states that each year almost 1 million individuals become victims of violent crime while working; about 500,000 victims of violent crime in the workplace lose an estimated 1.8 million work days each year; and the average cost to American businesses each year is estimated to be $36 billion dollars. If employers were to provide readily available security for all of their employees, they could reduce liability and increase their profits. There can also be psychological aspects that can eventually lead to a violent incident in the workplace if proper security is not in place to prevent these acts from occurring. Oftentimes there is nothing the victims of these crimes could have done to prevent them. However, management may have been able to prevent these acts by having a good security team in place to protect their workers. Although a business may have a security presence, that doesn’t mean it’s adequate. Sometimes security measures provided to safeguard employees as well as customers are not consistent with the potential threat. It is the responsibility of the employer to provide adequate security and to periodically examine the company’s physical workplace to identify weaknesses in security and to resolve those weaknesses. Workplace violence is a very serious issue and employers face legal liabilities when employees are victims of workplace violence due to lack of security. Victims of workplace violence have legal rights and are entitled to certain benefits, depending on their situation. Whether you were the victim of workplace violence or another type of workplace accident, the Miami work injury attorneys at Friedman, Rodman and Frank are here to help you with your case. 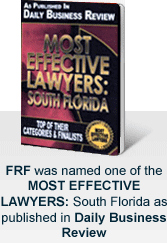 Simply contact our law firm online or call 305-448-8585 or toll free at 877-448-8585. We are available 24 hours a day, seven days a week. All consultations are free and confidential.